Have You Found Your Hot Spot Yet? When you choose to pursue big bucks on public land, the honey holes and hotspots can be few and far between. But don't let that fool you. They do exist. Over my lifetime, there have been some incredible public-land ambush spots I’ve come across, that if hunted right, produced big bucks year after year right under the noses of all the other hunters. I have always been drawn to public land. I admire the fact that I am hunting on an equal playing field with anyone else who desires to try. When you kill the king buck among all the other hunters, there is a lot of pride and a feeling of accomplishment I don't get when hunting over food on private with everyone else locked out. One of the greatest hunting spots I have ever had is near a road and off to the side in a spot most hunters miss. It’s a bowl of cattails mixed with trees. The beds are under the trees and are surrounded by water. To leave the beds, the bucks filter right thru a tight funnel where I like to set up. Me and a couple trusted friends have killed more than a dozen trophy bucks out of that bedding area exit. One year, rumors surfaced of a giant buck being seen in that area of the public. While glassing, I saw him one day and he seemed to be a really nice 10-pointer. I tried hunting him in the honey hole, but he was bedded off to the side with a doe and spooked as I approached. The next year, he was staying on private land across the street. I watched from a distance until the pre-rut when rumors surfaced around town about sightings on the public land. I thought for sure if he was in the area he would be in that bedding area. I killed the 165-inch 10-pointer the first day I hunted him. I watched him come right out of the same bed I had killed so many others out of. It was exciting because I’d killed the buck the whole town was after. So, I know what you’re thinking — what makes that spot so great? In this article, I’d like to dive into the answer and explain it as clearly as possible. I warn you though, finding these spots sounds easy, but it’s harder than it sounds to find spots like these, and on public, even harder to keep them a secret. What we are really looking for is primary buck bedding areas. That’s an area where big bucks prefer to bed year-round, unlike other areas which are more seasonal based on food, does or pressure. First, you need to find the right piece of public — one that holds mature bucks. They are certainly not created equal. I look past a lot of public properties to find good ones. In flat ground, I seek out areas that are thick and wet. Bucks need hiding spots to reach older age classes. In open or dry terrain, gun hunters can easily kill most or all of the bucks before they reach maturity (4½ or older). Marshes and swamps are great places to start. A lot of my biggest bucks have come from wetlands. In hilly areas, dry land expanses, and areas without many marshes or swamps, I look for areas the furthest from towns, cities, and campgrounds. Places without easy access, with no parking lot, where you have to cross a river, barrier, etc. Thick areas with few huntable trees are a plus. A good resource is your state game agency. 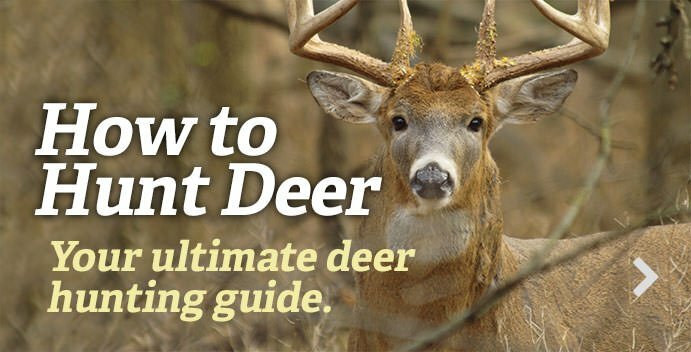 They can put you in touch with the areas deer biologist who can tell you where the best age classes are, and if any new properties are opening up. I have gotten some good leads from biologists. Now that you found the properties, you need to find the spots. The first thing I do is study aerials and topos of the property. Look for key features in overlooked spots. I study the access routes and cross out everything where everyone else would likely go. Usually, what’s left is stuff near the road between the parking lots, remote stuff with a lack of good tree cover, areas surrounded by water, or have a hard access. In most cases, I cross off 80 percent of the property before I even set foot on it. There is one public property I hunt that is about 800 acres of timber crop fields leased to farmers. I crossed out all dry land because of pressure and human trails and only focused on about 20 acres of marsh. Once scouted, I narrowed that 20 acres down to a 2-acre primary bedding area. The big bucks live in that 2-acre spot during daylight, but at night they feed up in the fields and oak ridges and leave sign the other hunters focus on. However, that’s night sign made when the hunters are not there. I and a few trusted friends have killed about 16 trophy bucks out of that spot since scouting that 19 years ago. There was a run of eight years in a row that I killed my Wisconsin gun buck there on opening day. Moving on, once you cross out spots not to scout, you need to drive by the spots and glass them. Then if they still look good, walk them (or in many cases, swim them). A lot of these spots are great because they are surrounded by water and that keeps people and predators out. A lot of my best spots would probably shock most of the people reading this. Bucks seek out places people don't go, and often that’s right beside the road, or between the parking lots. Pheasant and rabbit hunters walk the grass near parking lots and kick a bush or two, but no one goes into wet nasty cover and wades knee-deep to hunt bucks 50 yards from the road. Well, nobody but a few wise people who have figured it out. One of the biggest bucks I ever arrowed was living 75 yards from the main public access on a large public area. I glassed him from the hunter access parking lot on days leading up to the hunt. I slipped an arrow in him the first day I actually hunted him. Interestingly enough, I could see several hunters and trucks from the tree I was in. I had to wait for the hunters to leave the parking lot to get the buck out so I didn’t reveal my secret. Just a couple seasons ago I saw a sign that a big mature buck was living within a stones throw of a parking lot on another heavily hunted property. I set my son James Infalt up on a step ladder in some cattails and pushed the buck past him and he shot it. The buck jumped out of his bed less than 70 yards from all the hunters’ trucks. No one went that way because there was standing water and no trees. I have a few spots in hill country where the public hunter access is in a valley. Everyone follows the trail out into the woods and then starts spreading out. But no one circles back around and hunts where the big bucks bed on the bluffs — which is right beside the parking lot. They bed there and watch the hunters access walk in each day. The moral of the story — scout anything and everything that’s overlooked by other hunters. Another thing to consider is that public land oftentimes has little food on it — but across the street is lush fields on the private land. The thick public generally has better bedding than the private, but the private has the food. I have killed many unsuspecting bucks as they staged up and waited to cross the road after dark. Check the roadside for crossing tracks (from your truck) without alerting bucks to your presence. This will give you an idea of where to set up. I prefer to scout these areas in winter and spring when cover is down, and sign is easier to see. However, I have done well without scouting by guessing where they are and setting up based on sign coming out of the area. But, you get much better at guessing after you’ve scouted these types of spots and have a good idea of what to look for. When you scout, you’re looking for a lot of beds in a small area. You need to look at the exit trails and see how close you can get set up without spooking deer. The closer the better. I shoot a lot of these bucks within minutes of closing time despite being within 75 to 100 yards of their beds. Also, there should be a good escape into thick cover nearby. Big bucks don't like to hide in spots where they have to escape thru open areas. In low land, they love to be on high ground surrounded by water. This protects them from hunters and predators. Put 6 inches of water on the ground and suddenly hunters won't enter, I don't get that, but I see it all of the time. In hilly terrain, look for them on leeward sides about two-thirds up the hill. The biggest killer of these spots is the hunter himself. If you are lucky enough to find one of these honey holes, realize that the reason it’s a honey hole is because people are not harassing it. I would recommend only hunting it once or twice a season to keep it productive — three times maximum. I have seen the results of hunting spots like this five or six times in a season and they just go dead. I have had a few spots others have found and overhunted. Even when the other hunters leave it takes a couple seasons before mature bucks come back. With that said, one real important thing needs to be mentioned. Everyone loves to show off their big buck, and everyone needs a hand retrieving their buck. Loose lips sink ships. So be very careful not to tell anyone exactly where you shoot your bucks, and I’d be really selective about who helps me retrieve them. Even if you trust your friend, and he doesn’t/won’t hunt there, will he be able to keep his mouth shut? Sometimes, when scouting for deer, you find spots that scream "hot spot.” And maybe it is. But I find a lot more that turn out to be okay spots that merely look great than spots that produce year after year. And some will produce good during either the early season, rut, late season or gun season. The only way to really know is to throw a stand at it and see.